(PhysOrg.com) -- The launch of ESA's CryoSat-2 satellite from the Baikonur Cosmodrome in Kazakhstan, scheduled for 25 February, has been delayed due to a concern related to the second stage steering engine of the Dnepr launcher. Although the fuel supply of the second stage engine should be sufficient to get CryoSat into orbit, the fuel reserve is not as large as they would like it to be, according to the Ukrainian company Yuzhnoye, who developed and is responsible for the launcher. The situation is being reviewed, and measures will be taken to resolve this concern. Kosmotras, the launch provider, will inform ESA of a new launch date shortly. CryoSat-2 will fly in a highly inclined polar orbit, reaching latitudes of 88° north and south, to maximise its coverage of the poles. 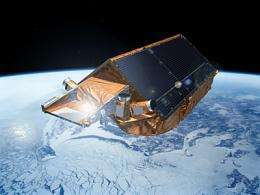 From an altitude of just over 700 km, CryoSat will precisely monitor changes in the thickness of sea ice and variations in the thickness of the ice sheets on land. These data are urgently needed by scientists to understand exactly how Earth’s ice is changing in response to climate change. For over 15 years, the ERS satellites and Envisat have been mapping the extent of ice cover. However, in order to understand how climate change is affecting the sensitive polar regions, there is an urgent need to determine exactly how the thickness of the ice is changing to get the full picture.